Arc the Lad, the adventure show that's just a touch darker then others of its type. The story follows a young hunter named Elk and his quest for revenge against the infamous Arc. Although it starts off simply, things gradually grow more complex as soon as our so called antagonist enter the picture. 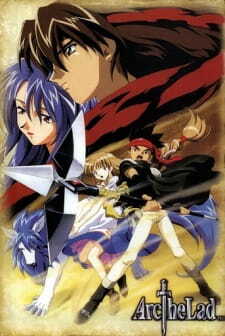 Still the main point of this series is to show the growth of Elk and the heroine Lieza as characters. What can revenge do to a person, what can being overwhelmed by hatred hope to accomplish? Though these may be questions that other shows have presented as well, it's executed well here because Elk never comes across as insincere or forceful in his emotions. Deep down, he's a nice kid, he's just troubled with how he should handle himself. Some of the more traumatic events that happen certainly don't help things. There is a lot of characters, too many in fact. Now this is based on a video game, so obviously it tried to incorporate everyone from the game, however it does leave a lot underdeveloped or underused due to the series's short length. Fortunately the characters are never annoying or terribly stereotypical, so the ones that do get used are executed in a fairly decent matter. The main focus is of course on Elk and Lieza as said before. Thankfully both get appropriate growth and bonding time, while the other characters mainly act as support or a moral compass for them. Elk isn't just a guy where revenge is everything to him and Lieza isn't just a hopeless damsel in distress thankfully. Maybe they aren't the most original characters in the world, but they aren't poorly written by any means. All are fairly standard for the time. Nothing terribly impressive or original. The character designs are cool, but the animation is semi-lackluster which hurts the impact of some of the fight scenes. Actually fairly enjoyable for an adventure show. It might start semi-slow but I can't say the show is ever that boring. Once the plot gets rolling it actually gets pretty exciting if you ask me. Some of the traumatic events that happen are kind of gut-wrenching, which I personally didn't expect from this show so kudos for the surprise. I enjoyed this adaption a lot more then game story if that says anything. It's nice to get a more mature adventure show every once in awhile. I really think with a tighter cast and a higher budget this could have been something a little more special. Regardless it's an enjoyable watch and I can recommend it to anyone who likes adventure shows.